An upcoming For Honor patch will bring improvements in terms of its gameplay, Ubisoft has announced. 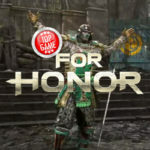 According to Ubisoft community developer Eric Pope, their team has been actively listening to the community, and they based these improvements from players’ feedback. Bots Replacing Players in Duel / Brawl / Elimination Game Modes: Players who took part during the Beta had concerns about Bots with full health replacing players who leave. The player will now be replaced with a dead Bot in the mentioned game modes. Ubisoft did not mention when these updates will be released. We’ll keep you posted as more information is released in the coming days. For Honor AI Taunt You When You Get Killed, and You Can’t Taunt Back! Looks like someone from Ubisoft had fun creating taunts for For Honor AI bots! They are so hilarious, you wouldn’t want to miss them! Check em out now!